Civilizations rise, and they fall, often by their own hand. Ours, is no different. And this is how it happened. Living at the outskirts of a small town in Iowa, a young farm boy named Josh Peterson, finds his life rocked by a series of reoccurring dreams. Considering them at first to be little more than the product of an overactive imagination, Josh finds himself jolted from reality one day as two figures suddenly emerge from these dreams and intervene in an effort to save his life. As the years pass, this event and the images that seemingly spawned it, come to shape Josh's life, preparing him for a crisis far beyond anything he had ever thought possible. In a world growing all the more dysfunctional with each passing year, he and his family watches as greed and political corruption coalesce to push civilization to the lip of an abyss, even as it draws Josh into the heart of this sweeping crisis. As events steadily devolve to the point of no return, Josh suddenly discovers the mysterious figures from his dreams are but messengers for something far beyond us – something that had anticipated this culminating event in all its misery, eons before the advent of modern man. "If you are looking for your standard formulaic, 'summer blockbuster' kind of book with the climatic heart of the story on page two, followed by a series of contrived and highly artificial mini-cliffhangers crammed into every page, then this book is not for you. Take my advice: put it down, and just walk away. "If on the other hand you relish the opportunity to read a piece that seems destined to become a modern classic, which gracefully lays bare an expansive picture of time itself in vibrant detail even as it tells the story of our own civilization's demise – a depiction so close to reality that it's liable to run a sharp chill down your spine – then this is the story you have waited your whole life to read. Take it. Run home and devour its every page; now, while there is still time. Do it before any more of its prophetic voice is allowed to come to pass, and you find your delay has only hastened our end. Now, before you realize your hesitation has sealed our fate, as it empowers those who are today pressing our world downward, into the abyss that is now opening up before our very eyes... "
Rising up over a small hill, a collection of men and boys in blue uniforms gather along a crooked ridge line. As their numbers swell, a few of the younger boys begin jostling for position, vying for a clear view of the enemy waiting down below. At the opposite end of the field, their somewhat wiser counter-parts in this conflict bide their time. Having learned their lesson the hard way, they wait, muskets in-hand, looking for the fight this time to come to them. With the now-familiar clank of metal-on-metal, the newly formed line quickly develops a row of needle-like bristles at its leading edge. Drawing his sword, and pointing it towards the waiting enemy, the Lieutenant shouts: “Forward boys! Cadence!”, and the bristling skirmish line begins its advance down the hillside in lock-step. Undaunted, the scrabble of men in gray and red uniforms at the opposite end of the field hold their position—waiting. Halfway down the slope, the Lieutenant shouts: “Double up boys. Up!”, and the line accelerates into a trot. Driven by a surge of adrenaline, many in the advancing line begin a low roar of a shout that quickly spreads through the ranks, rising in pitch and volume into a full-throated scream. In an instant, the sweeping Union line suddenly erupts in a billowing spray of musket fire, sending a blizzard of hot lead ripping across the open field. At the opposite end of the skirmish, the Confederate infantry answers in kind. Touching a smoldering wick to a tiny nub of a fuse, their artillery then adds its voice to this melee, pouring several hundred pounds of lead grapeshot into the advancing Union ranks and cutting gaping holes into their now faltering line. Taking a round of grapeshot to the face, several of these Iowan infantry men are thrown backwards and stumble. Seeing his fourteen-year-old friend take a round and fall, one of the older boys in the line hesitates and turns back his way. As he does, a Confederate musket round slams hard into his left shoulder and spins him around, knocking him backwards over his friend and dropping him into a gathering pool of his friend’s blood. “MacIntire!” the boy shouts as he grabs his friend’s coat, pulling himself over to face him. “Joshua!” exclaims the fourteen-year-old boy as his eyes begin to glaze over. “Tell my mother, I . . .” he sputters around a mouth full of blood, as he trails off, and drifts away. “Zeek! Ezekiel!” Joshua stammers as his head begins to spin, and the darkness slowly gathers around him . 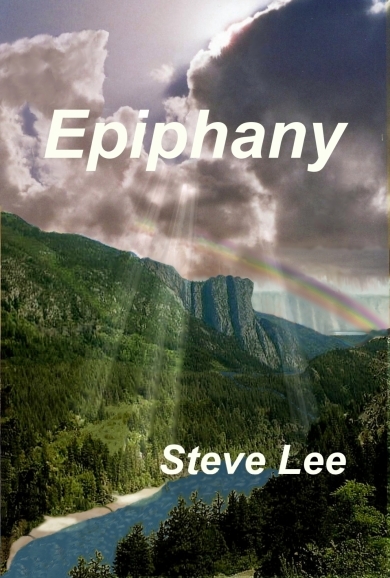 . .
"Epiphany is an amazing sci-fi story that will hold your attention from the first page. But MORE than that, it's an amazing trip through history with a look at the 'rise and fall' pattern that has toppled great past civilizations (Bubonic Plague, the U.S. Civil War, the Fall of Rome) and how mankind (OUR mankind) continues to make those same mistakes over and over. Lee's characters - especially Josh - are beautifully created and very relateable. The story itself is compelling and one that you'll find yourself thinking about long after you finish reading it. A great book for lovers/followers of sci fi/fantasy/history/current events. I loved it! " A.M.P. "What if whenever you went to sleep you were able to see and feel the emotions of those you were visiting, whether it be the past, present of future? Would you like to see the past and find out what a real dodo bird was? Would you like to visit the future and perhaps see how humans are living—if they're living? Josh,one of the main characters, is able to do this, however he has no control over anything he sees or where/what he sees. It just happens once he goes to sleep and through these dreams he progresses from past to future. In case you need a little more information at certain key moments, look to the back of the book and you'll be filled in completely.